Kyle and his fiancé walked into Irelia Fine Jewelry, having spent several days visiting jewelry stores trying to find a way to replicate his grandmother’s beautiful ring. 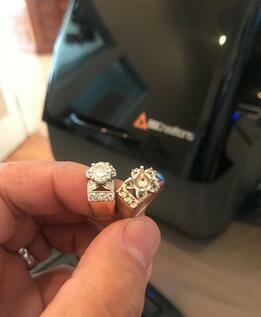 Immediately, Fernando and Irelia Cortes, owners of Irelia Fine Jewelry and Red Door Distributions, set to work proving that this seemingly impossible process of creating an exact replica was indeed possible – through the use of a B9 Scan 350 and a B9 Core Series, a process familiar to Fernando. It’s understandable that Kyle was hesitant – after all, his grandmother’s ring was irreplaceable and precious to his family. And not a single one of the jewelry stores they had visited had been able to promise a convincing end result to this heirloom redesign project. 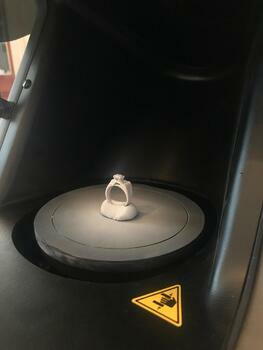 Fernando calmed their nerves, taking the opportunity to place the ring in the scanner and immediately demonstrate how the B9 Scan 350 would ensure accuracy without causing any damage to the existing ring. Kyle was instantly sold when he learned that Fernando could not only replicate the ring, but also add structural integrity that ensured the new ring would last for many generations. There had been a few other jewelers who had claimed they could replicate the ring – but none who had been able to promise a ring that was more structurally sound, and none who had walked them through the process and openly shared how they would do it. For jewelers, gaining the trust of a customer can be quite a process. Leaving extremely valuable pieces in the hands of someone they may have just met requires a lot of confidence in the jeweler. But once Fernando had shown Kyle his process, he was ready to pay for the ring and leave it at the jewelry store so they could start the redesign immediately. 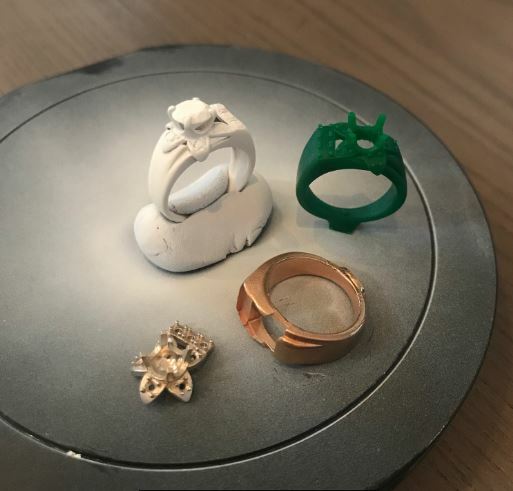 Kyle and his fiancé left the ring with Fernando, then came back shortly so they could inspect the new 3D printed resin model before it was cast in two separate pieces of metal. They were impressed and shared their approval, so Fernando continued to cast, finish, and set the new ring with Kyle’s grandmother’s jewel. Kyle’s fiancé now proudly displays the new two-tone ring (with a stronger base and more sturdy prongs) on her ring finger. 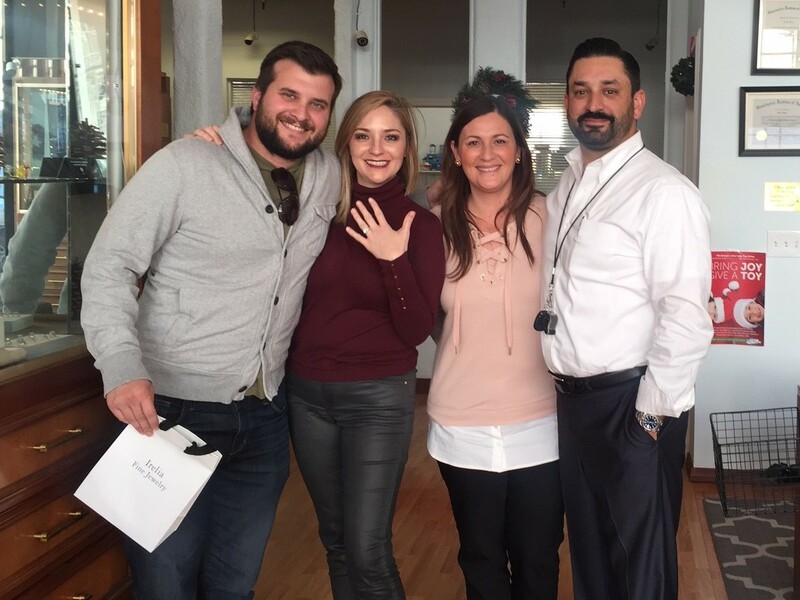 Kyle walked away knowing that his grandmother’s ring was taken care of, and that his new ring was competitively priced and perfectly created, and the Cortes’s were able to earn a customer for life. Read more stories of impact. 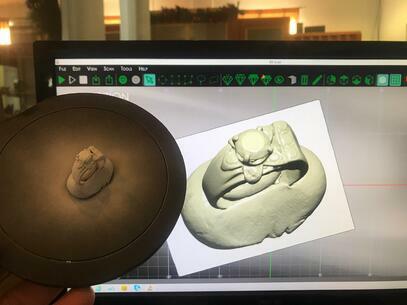 See how our 3D scanner saved a soldier's 60-year-old heirloom or learn how it cut down design and production time 80%.